Places to see in Deoghar: There are a number of sights of religious importance in this holy town of Deoghar. One of the most remarkable tourist interests is the age-old temple of Baidyanath Dham, named after Lord Shiva. Tousands of pilgrims visit this temple, especially in the month of ‘Shrawan,’ particularly on ‘Mondays.’ The earliest educational institution of Ramakrishna Mission, known as Ramakrishna Mission Vidyapith, established in 1922 is also located in Deoghar. Moreover, you will truly admire the enchanting beauty of the Nandan Pahar, also known as the Nandan Hill Park, edging the town of Deoghar. The hill also hosts the famous Nandi Temple and flanked by a beautiful lake attracting tourists. The beautiful Navlakha Temple housing the deity of Radha-Krishna and boasting its sheer architecture is a worth visit for all tourists. Satsang ashram in Deoghar is one of the most sacred sites as Thakur Anukul Chandra, spent the last 25 years of his active life here. Nearby attractions of Deoghar: Deoghar is also admired by a number of nearby attractions. Tapovan located 10 km from Deoghar houses a temple of Shiva, called Taponath Mahadeva, which is the prime attraction of the place. The internationally famed Rikhia Yogashram established by Swami Satyananda Saraswati is nestled at a serene hamlet called Rikhia in Deoghar District. The ashram is mainly visited by the tourists during the annual fair held in the months of November or December. Just 43 km from Deoghar, there is a beautiful temple of Shiva at Basukinath, where holy water is offered by the visitors to Lord Shiva. 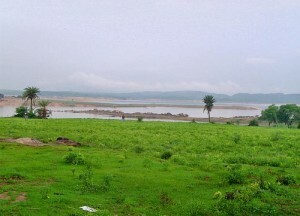 Trips are also made by pilgrims to Trikut, located 24 km west of Deoghar. This hill temple is made of huge boulders. You can also visit the temple of Kundeshwari, located one kilometer away from Chandi Hill. Idols of Mother Parvati and Lord Shiva, Lakshmi and Ganesh have been preserved here. The Ashram of Pagla Baba located 8 km from Tower Chowk is also worth visiting. Idols of Radha-Krishna made of eight metals are installed in this ashram. In the east of Deoghar you will find a small hillock called Hathipahar or Mahadevatari. The hillock is called Hatipahar because from a distance it appears like an elephant. Nearby the hillock, there is a small stream, the water of which is believed to contain medicinal values. A tour to the Devasangha Math, located 2 km from Deoghar railway station is also quite refreshing. The Nava Durga Temple at Devsangha Math houses a deity of Goddess Durga in the Bengali style. Bulk of devotees visits the place mainly during the Durga Puja celebration. Those who want to explore further afield can make trips to Dumka (65 km), Massanjore Dam (98 km) and Giridih (112km). 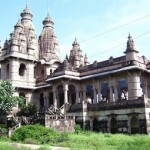 Things to do in Deoghar: Sightseeing to various temples and ashrams is a major activity of the people visiting Deoghar. Pilgrims visit in thousands to Deoghar during festive times. You will experience a spiritual enhancement while visiting the religious places dominating the district. Some recent trek routes have also opened in this area like the 110 kms long trek from Kanwar of Sultangang to Deoghar. How to reach Deoghar: Deoghar is well accessible by roadway from Kolkata (373 km), Patna (281 km), Ranchi (250 km), Dumka (67 km), Shimultala (53 km) and other places. Regular buses also run to Deoghar from surrounding towns. The closest railhead of Deoghar is Baidyanath Dham. The nearest main railway station to Deoghar is Jasidih around 10 kms on Howarah – Patna – Delhi line. There is another Railway Station named Baidyanath Dham (Deoghar) which is a terminal station of a 7 kms branch line originating from Jasidih Jn. There are regular trains from Howrah to Jasidih and connecting trains from Jasidih to Deoghar Station. You would also get trekkers, buses and auto rickshaws from Jasidih to Deoghar. Best time to visit Deoghar: You can visit Deoghar any time of the year but the month of Shravan in Hindu Calendar (which corresponds to July and August) there is a huge rush of pilgrims to the Baidyanath temple. Lodging and dining facilities in Deoghar: In Deoghar, you can stay at the Jharkhand State government accommodation managed by Jharkhand Tourism or in some private hotels located all around. Both private and government accommodation at Deoghar is booked by our affiliated authorized Jharkhand Tourism tour operators. Dining facilities are decent throughout Deoghar and Bengali cuisine is served in most restaurants and hotels.